Warding sigils are a type of spell work used to hide an individual, or protect a location or building from angels or demons. 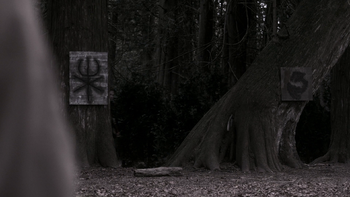 Sigils appear to range from Hermetic, astrological, alchemical, Honorian / Theban, Kabbalistic and Enochian. If warding sigils are altered in any way, no matter how slight, they are rendered useless. 1.11 8.02 What's Up, Tiger Mommy? 1.25 11.09 O Brother Where Art Thou? Demons cover a funeral home in Greybull, Wyoming with sigils to "angel-proof" the building, keeping any angels from entering. 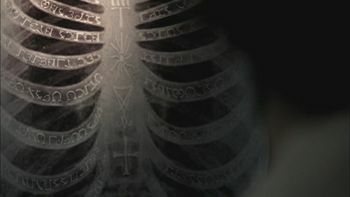 Castiel engraves Enochian script on the ribs of Sam and Dean, warding them from being found by any angels. Castiel locates Crowley's residence, which has been warded to keep angels from entering. 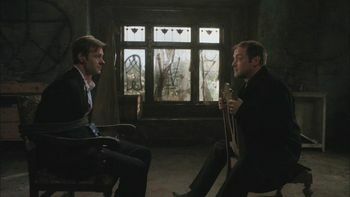 Having been found out that he aided the Winchesters by giving them the Colt, Crowley squats in an abandoned house covered in warding sigils to stay hidden from Lucifer and his demons. 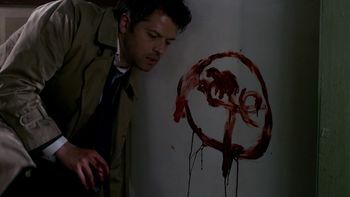 Having been injured in his fight with Rachel, Castiel teleports to Bobby's home and draws a warding sigil with his blood to keep hidden from any other angels. 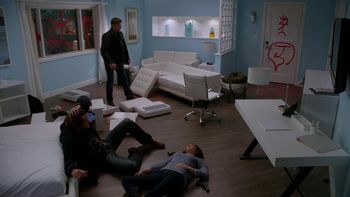 Sam, Dean and Bobby "angel-proof" Bobby's home after discovering that Castiel is in league with Crowley. 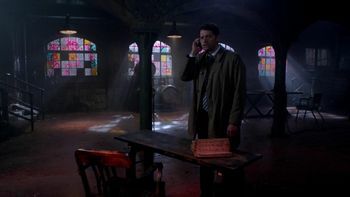 However, Bobby gets some of the angel-proofing wrong, which allows for Cas to enter and speak with Dean. 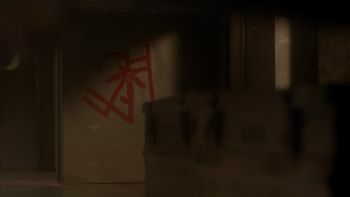 After learning from Bobby that Castiel will be looking for her to get information on how to open a door to Purgatory, Eleanor Visyak goes into hiding, staying in a cabin protected with warding sigils. However, the moment she steps outside of the cabin, Castiel locates and abducts her. 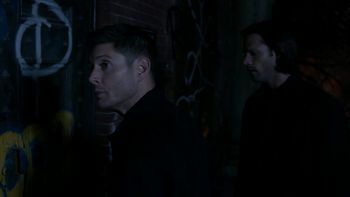 After Castiel breaks the mental wall in Sam's mind to keep the Winchesters from coming after him, Dean and Bobby take Sam to Bobby's Panic Room, which has been warded against angels. 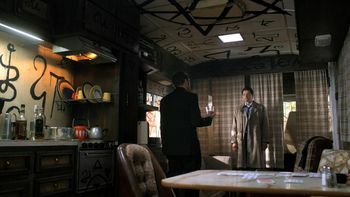 Having been given a reprieve by the newly powered Castiel, Crowley holes up in a Winnebago covered in warding sigils. However, as Castiel now has power akin to that of God, he is easily able to bypass the warding. 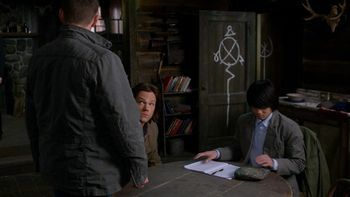 Sam, Dean, Meg, and Castiel take the newly-awakened prophet Kevin Tran to Rufus's Cabin to study the Leviathan tablet, where they draw warding sigils to keep hidden from any angels or demons. 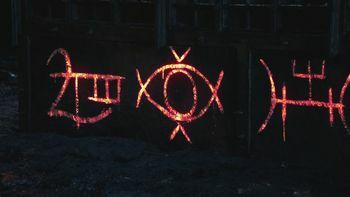 The abandoned building where the god of greed Plutus is holding his auction is covered in various warding sigils to keep the bidders in check. However, Plutus' assistant, Beau, is bribed by Crowley to show him "loopholes," allowing Crowley to use his powers. 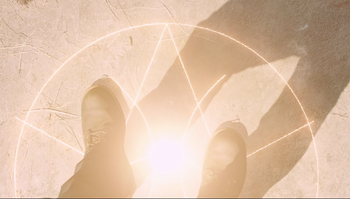 Crowley uses Enochian warding to hide himself, Kevin Tran, and the potential prophets from being found. 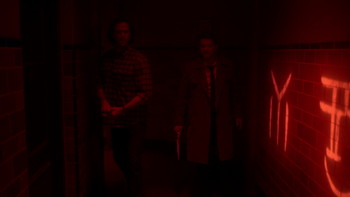 There are four main points of warding –- north, south, east and west -- which Sam and Dean need to alter in order to allow Castiel entrance into the building. 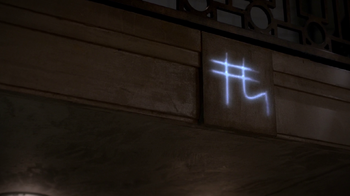 After discovering one of Lucifer's Crypts, Sam and Meg proceed to spray-paint warding on the building to hide it from Crowley. 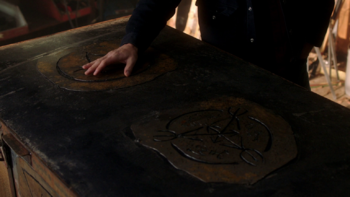 Freaking out over hearing Crowley's voice in his head, Kevin paints Enochian demon-warding symbols on the windows of Garth's houseboat, but when Crowley arrives, he simply shatters the windows and the symbols, allowing him entry. After being taken by Crowley, Kevin is placed on a replica of Garth's boat that has been warded from angels. When Sam and Dean find Metatron, they learn that as the Scribe of God, he is able to erase Crowley's warding, allowing him to retrieve Kevin. When Sam and Dean learn that Crowley is killing people the Winchesters have saved in the past to get them to stop the trials, Crowley sends them to a location as a dare for them to stop him. When they arrive at the Ivy Motel in Indianapolis, they are surprised to find Sarah Blake. 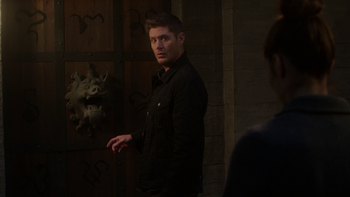 Sam tells Sarah what is happening while Dean spray paints the room with warding sigils. 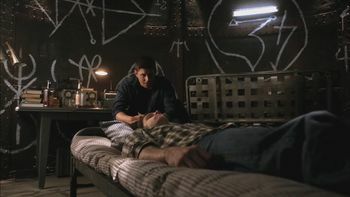 Dean draws warding sigils on the walls of Sam's hospital room to protect him for the coming angel assault. 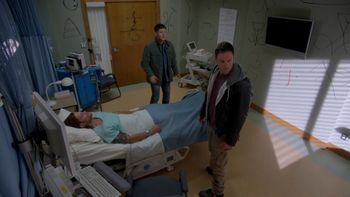 However, the warding further weakens an already injured Gadreel, who becomes unable to help heal Sam. Castiel uses the last of his money to have Enochian warding script tattooed on his ribs, to hide from the other angels hunting him. After being released, the Wicked Witch locates Crowely in the Men of Letters Bunker dungeon. When she tries to cross over the devil's trap, she learns from Crowley that it is warded from everything, including wicked witches. 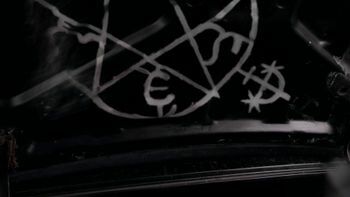 While making a prisoner exchange with Metatron, Gadreel is transported to the exchange in the trunk of the Impala, which has the inside painted with angel warding, which Metatron erases with ease. 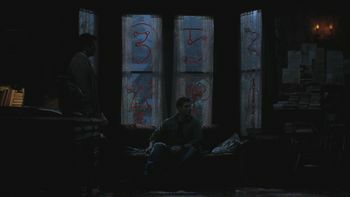 At Castiel's base of operations, enemy angels are placed in holding rooms which have a special warding painted on the door windows. The angel Ezra and reaper Tessa were interrogated by the Winchesters in this room. Not happy with Rowena dragging her feet in decoding the Book of the Damned, Sam decides to shackle her in iron in an abandoned distillery covered in various warding sigils. Rowena continues her decoding of the Book of the Damned with the aid of Charlie, who was brought in by Sam. 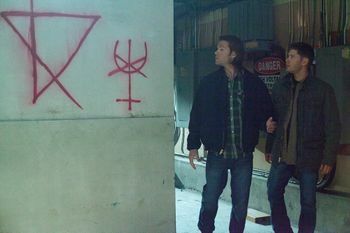 When Sam and Dean locate Crowley's Lair, they find the building covered in warding sigils, and only a simple bike lock on the door. 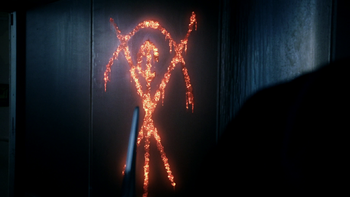 To contact Lucifer in Hell, Rowena places various warding sigils around the holding cell he is to be summoned into. 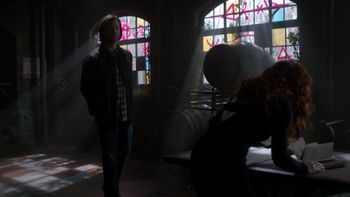 However, unbeknownst to Crowley and Sam, Rowena has been working with Lucifer in secret, and sabotages the warding, allowing it to fail and giving Lucifer the opportunity to bring Sam into the cell with him. After retrieving the Hand of God from the Nazis, the Woman of Letters, Delphine Seydoux, boards the USS Bluefin back to the United States. 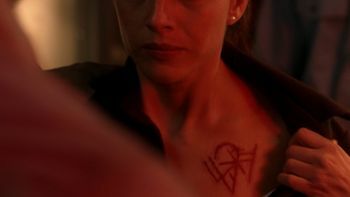 Before the submarine sets sail, she places special warding sigils around the hull that are connected to a sigil carved over her heart. 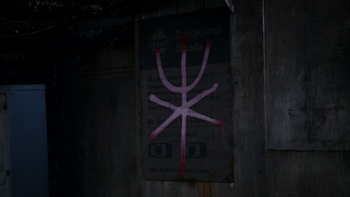 The sigil, taught to her by Clifford Henshaw, her mentor in the Men of Letters, protects from supernatural interference, including angelic, hence Lucifer is not able to make the time travel trip past the hull of the sub. 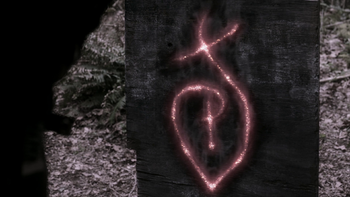 As the sigil's magic is connected to the user's heart, its power lives and dies with them and can only be deactivated by killing whoever the sigil is bound to. 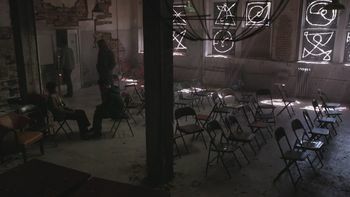 After finding the location of God from consuming the soul of Donatello Redfield, Amara arrives at the Men of Letters Bunker, first erasing the warding that had been put in place before materializing in the main room. Lady Toni Bevell tries to persuade Sam to give up the names of other hunters by telling him how the hunters in America are terrible at their job, and how there have not been any monster-related deaths in Great Britain since 1965, due to the British Men of Letters setting up wards at every thoroughfare, bridge, dock, and airport, alerting them to any monster that sets foot in Great Britain. 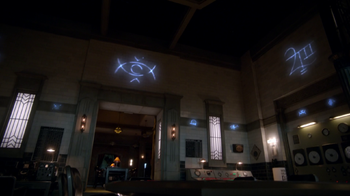 The farm house that Lady Bevell has rented is revealed by Castiel to be adorned with warding sigils, preventing him from entering. 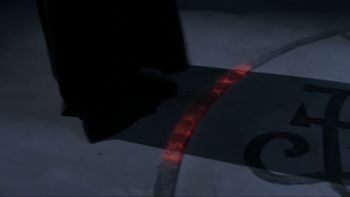 When Dean attempts to enter the building, he steps on and activates a ward like a land mine, which incapacitates him and allows Lady Bevell to capture him. 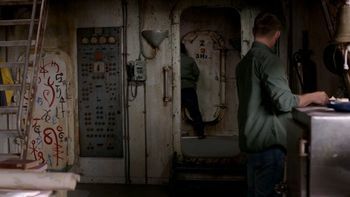 After the skirmish between the Winchesters and Lady Bevell comes to a stand still, Mick Davies arrives, having deactivated the warding, allowing Castiel entry. After finding out the crossroads demon Jael is in the house, Bucky Sims and Elvis Katz try to open the front door, which immediately closes on them. As they continue to attempt to get it open, Max Banes tells them it's pointless and reveals that the house has been warded to keep them inside and prevent anyone outside from coming in. Realizing they need a break from their long drive back to the Men of Letters Bunker, Sam convinces Dean to stop at a motel. 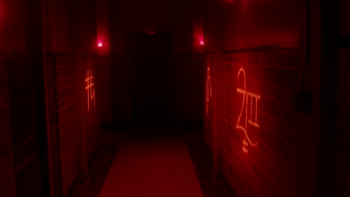 While Dean and Jack eat their burgers, Sam spray paints warding sigils on the motel room door. Later Donatello Redfield arrives out of the blue, claiming he felt Jack's presence on earth and assumed it was God. 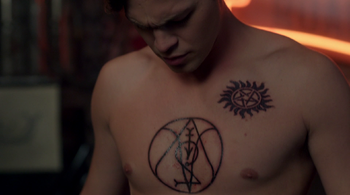 Dean and Sam decide to put warding tattoos and an anti-possession symbol on Jack in case angels and demons can track him the same way. The tattoos immediately heal and disappear after being completed. 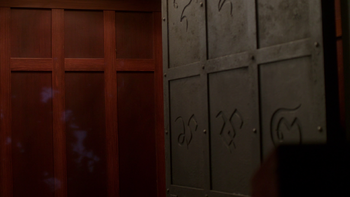 Upon arriving at Luther Shrike's home, Sam finds a front door made of iron and adorned with various warding sigils. 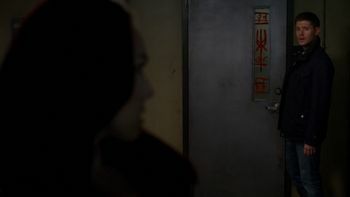 The door/mechanism protecting Luther Shrike's vault room is protected with similar warding sigils. 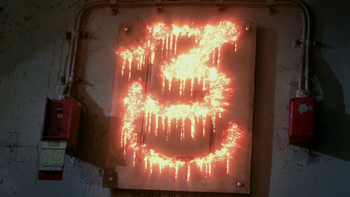 While taking refuge in an abandoned ship from a contingent of angels trying to get Jack, Sam begins spray painting warding sigils inside the ship. The angels are not able to pass this warding, but they pool their power and in unison begin pounding energy into the ground. 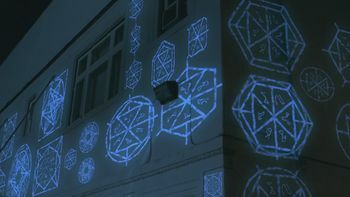 This slowly alters and nullifies the sigils by causing the spray paint to drip. 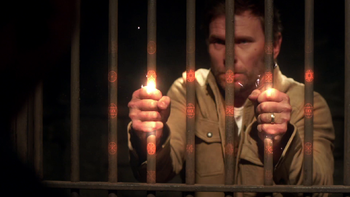 Castiel and Lucifer are kept in specially-warded prison cells in Needham Asylum. The warding on the cell's bars will cause immense pain when touched. When Jack is thrown into Mary's prison cell, he remarks that he hasn't been able to use his powers, along with his head continually hurting. Mary tells him she has had migraines since being locked up and surmises that the angels are using warding so strong that even humans can feel it. Together they realize there is a weak spot in the warding that they can exploit and make their escape. 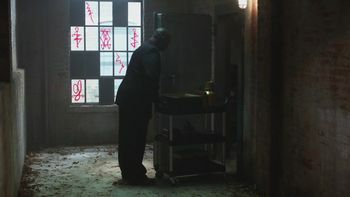 Sam attempts to strengthen the Bunker's warding in preparation for Asmodeus' incursion. 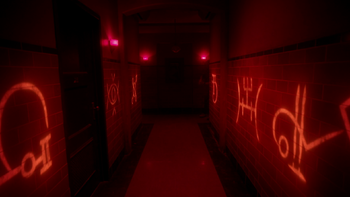 The warding fails, however, flashing on the walls before disappearing, allowing Asmodeus and his demons to enter the Bunker. As the Winchesters and their group approach the Dayton settlement in Apocalypse World, Castiel is forced to stop due to the warding. 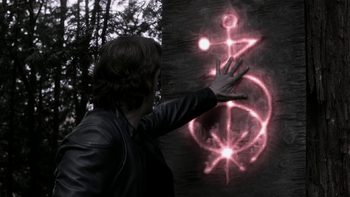 Gabriel alters a sigil with his angel blade before placing his palm on it and causing it and the other wardings to burn out. 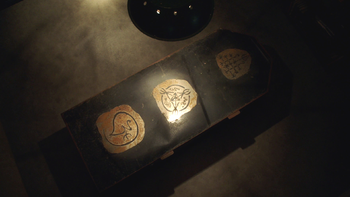 The Ma'lak Box Dean builds is adorned with various warding sigils. 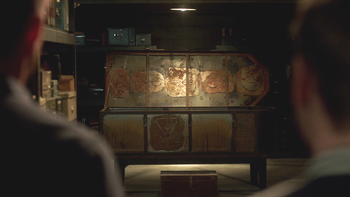 Mary keeps an Enochian puzzle box containing the demon Abraxas in a locker covered in various warding sigils. The warding on the Ma'lak Box, including the interior.